With increased flexibility, easily identified by a reduced force-to-bend and small minimum bend radius, Flexible Components TLCTCO will quickly demonstrate reasons to include this new hose construction in your demanding process applications. While achieving flexibility in hose assemblies is always a goal in hose design considerations, pressure limitations, long-term service life, hose durability and ease of handling must also be considered. TLCTCO meets these objectives and is ideally suited for many critical process applications in the chemical, pharmaceutical and industrial marketplace. 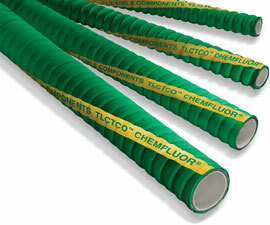 High purity, ultra smooth Chemfluor® FEP fluoropolymer liners used in the manufacture of Flexible Components TLCT series hose have been leading the process industry for many years. The Flexible Components TLCTCO hose series is an improvement in flexibility of a proven, reliable industry leading product line that we are sure will add increased productivity, ease of handling, better value and increased service. Chemfluor® is a registered trademark of Saint-Gobain Performance Plastics.